A pair of cosmonauts are preparing for Russian spacewalk while a pair of NASA astronauts are working on a U.S. spacesuit. Meanwhile, another cosmonaut and a Japanese astronaut are working a variety of microgravity research and orbital maintenance. Commander Gennady Padalka and One-Year crew member Mikhail Kornienko are getting their tools and gear ready for a six-hour spacewalk planned for Aug. 10. They will exit the Pirs docking compartment in their Russian Orlan spacesuits for a photographic inspection of the station’s Russian segment, retrieval of an experiment, window cleaning and surface sampling. The duo also spent time Wednesday logging their food and liquid intake for the Korrektsiya biomedical experiment. 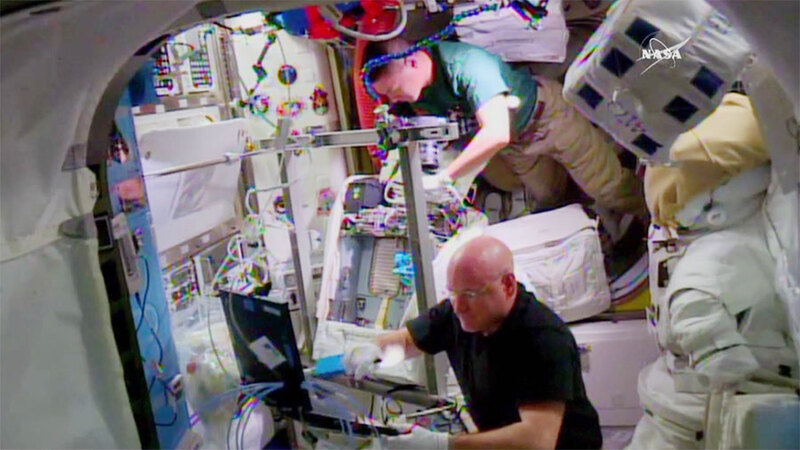 One-Year crew member Scott Kelly and Flight Engineer Kjell Lindgren were back at work again in the Quest airlock installing a fan pump separator in a spacesuit. New Flight Engineer Kimiya Yui analyzed microbes then moved on to a fluid physics experiment. Cosmonaut Oleg Kononenko worked on Russian maintenance tasks before exploring how microgravity disturbs the motion of crew members for the Motocard study. Wonderful to hear about all the work you guys do up there as you hurtle around Planet Earth at 17000+ mph. So exciting…. And must be scary also… at times. But what an experience… Must fill you with awe and wonder to look down at this amazing miraculous shining planet. Respect, admiration and Love to the six of you .